You don’t have to be a weaver, spinner or dyer to join our guild. Several members only knit or crochet but are inspired by the workshops which are very varied and can add new skills. See our programme. Visitors are always welcome at our meetings. The fee is £5 for the day including tea or coffee. Membership is £24 pa.or £36 joint membership and members pay £2 admission at meetings. For a membership form or more information there is a contact phone number on our PR leaflet that you see by clicking the link below. Our guild was affiliated to the Association of Guilds of Weavers, Spinners and Dyers in 1981. Several founder members are still with us and currently we have over 70 members. 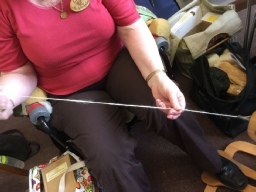 Below is a photo of Celia, one of our members demonstrating long draw. She kindly stepped in when Pam Austin wasn’t well enough to do it. 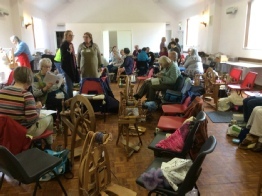 Jenny our chairman is holding a spin-in at her home for guild members on Sat. 4th May. 10.30 am- 4 pm. Tea and coffee provided but bring your own lunch.